Entrepreneurs and marketing and sales professionals aren’t looking for “fill in the blank” exercises to help them run their business. Nor do they want to wade through long theoretical explanations of strategy. They need to know howto execute real-time marketing into a business plan that gets results. Learn a six-step process that provides your business with the fastest and most efficient method to create a plan for business growth—and a life-long skill that can be used to continuously improve your business. I am always looking for new ways to market my blog and now my upcoming e-book and this book was like a course within a course. The book was so complete, I was amazed at the thoroughness of this book and how well the book itself goes into everything from basic marketing principles to social networking and more. Whether you know a lot or a little about marketing this book will open your eyes to everything that you will need to know to change your organization for the better. What this book helped me better understand was how to better create strategies for me to build a larger follower base for my blogs and hopefully building a buyer base for my upcoming book. This book has a bit of everything and it was easy to follow. 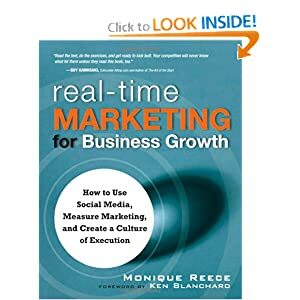 The author has put everything that you would ever need to know about marketing all in one place. If you are looking for the consummate book on marketing, look no further than this book.